On discouraging days you calculate the time it took you to write a book, divide that by the amount of money you made on it, and moan about writing being the poorest paying job on the planet. You wonder why you put yourself through all the work and ups and downs of writing for publication. Yet something deep within you wants to start planning the next book. Why? You are a writer. To be fair, writers are not the only ones who feel this passion to create. Quilters search for patterns, dig through fabrics, plan, dream, measure, cut, sew, quilt. Few of them would make minimum wage for hours spent. Classic car guys seldom restore old cars purely for the money it earns them. Athletes, musicians, gardeners, and cooks strive for excellence rather than dollars. Writing books is a risky business. It doesn’t come with guarantees. I look to the Lord to lead me from project to project, do my best to write and promote, and leave the results with him. Most often I don’t see how God may be using my writing, but once in a while I catch a glimpse that God is using my writing in more ways than I can see. This is one of those weeks. If you’ve been following me at all you know that the Lord led me, a few years ago, to write Edges of Truth: The Mary Weaver Story. Mary was a godly Christian woman from Marshalltown, Iowa who was providing childcare for an 11-month old baby when the baby quit breathing. Though Mary administered CPR and called 9-1-1, within a day the child died. Before long Mary was charged with first-degree murder. Some of the doctors were convinced that Mary had shaken and slammed the baby because of certain injuries that cause medical experts to diagnose shaken baby syndrome. Editors and agents wouldn’t touch this story because they felt it happened too long ago and Mary wasn’t a celebrity. But Mary, her lawyer Steve Brennecke and I felt the Lord leading us ahead. We published this book in November of 2013. This story has moved my own heart as I wrote it and others have told how it has challenged their faith. Mary has spoken at quite a few events since then, some of them with secular audiences, to show how God worked in her story. We wrote this story to give God the glory for the amazing things he did in Mary and Steve’s life, but we also wanted to shine the light on an American legal problem that continues today. Medical experts are using controversial interpretations of medical findings to accuse or convict innocent people of child abuse or murder. Each year hundreds to thousands of parents or caretakers are accused, and sometimes convicted, of child abuse because of unproven medical theories. 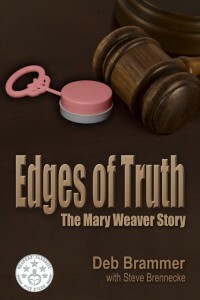 This kind of evidence sent Mary Weaver to prison. Later she was completely exonerated, but we want our book to spotlight the problem. In the last few months, two total strangers wrote to say their sons had been accused of abuse in similar situations. This week we see a bit of progress. A coalition of accused families has launched a petition to be presented to Congress asking for an objective evaluation of today’s medical guidelines for diagnosing child abuse. This is a beginning of challenging mistaken medical assumptions that has endangered innocent families for decades. Mary, her story, and our book is one small part of that effort.